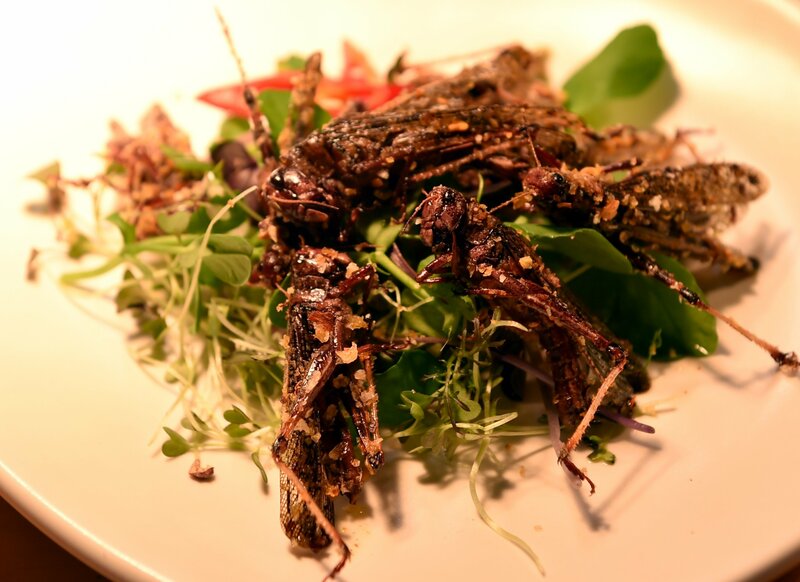 We may be unfamiliar with eating insects in the West, but these days you may well find a few ants or locusts or huhu grubs turning up on plates in some of New Zealand's leading restaurants. While some people see insects as exciting new, healthy and environmentally friendly ingredients, others may still regard them with aversion even though people in other cultures, particular in Asia, Africa and Latin America, have been eating them for centuries. Peter Randup and Rebecca De Prospo, who founded Anteater in Christchurch about a year ago, are promoting local insects for food and selling them to chefs in high-end restaurants. ''Chefs love the products, and almost all of them will agree that bugs are the future of food. They acknowledge the problem with the current way we are producing protein, so from their point of view, they want to be part of the movement that solves the problem. ''Also it's a really exciting new set of flavours and textures they can play around with, a new ingredient for them,'' Mr Randup said. He explained that with leaders in the food industry using these products in creative ways that people enjoy, it will start shifting people's perceptions to realise that bugs are food and that they have amazing flavours when they are prepared properly. ''Most people don't realise the incredible range of flavours - you've got bugs that taste like coffee, cashews, pistachios, mushrooms, kaffir lime, even TNT lollies. Native ants harvested around Christchurch taste of kaffir lime and are used as a garnish by several chefs, including award-winning Roots in Lyttlelton's ''Ants on koura'' - approved by and in tribute to the ''Ants on a shrimp'' dish by world-renowned Noma restaurant in Copenhagen. Mixologists are experimenting with them in cocktails, and a craft brewer is looking at using them to flavour beer, Mr Randup said. Locusts were often compared to freshwater prawns with a pork crackling crunch - the same sort of crunch you got from a crisp but more savoury because of all the protein. In Dunedin, Greg Piner, of Vault 21, serves locally-farmed locusts on his weekend menu and says he is proud to help set the trend. But besides the novelty and flavour factors, there are many more serious reasons for including insects in our diet. ''There are bugs that have more protein than steak, weight for weight; bugs that have more omega fatty acids than salmon, and bugs that have more calcium than milk. You can't help but start thinking they must be a superfood,'' Mr Randup says. With an increasing world population, another important reason is that it takes fewer resources to raise insects than mammals or birds. Also bugs are gregarious - they naturally cluster together which is an ethical plus, unlike chickens or salmon, he said. Anteater focuses on local insects, although cricket powder is produced overseas and is growing in popularity internationally. It is promoted as a flour substitute but wheat is an efficient source of protein and they find it too strongly flavoured to be more than a supplement, Mr Randup said. They already gather ants in Canterbury and are working on farming huhu grubs which are expensive to harvest from the wild. New Zealand locusts, which are raised in Dunedin, are a different species from the locusts that plague crops in Asia and the Middle East. ''Our species of locust only eats two species of grass. It's a very fussy eater by contrast which is quite interesting. The weeds are spat out,'' he explains. Anteater's vision is to develop an insect ''mince'' that can be used as a direct meat substitute. In its short existence Anteater has already won several prizes, including, in October last year, the University of Canterbury's Entree $85,000 Challenge competition.